Google announced on Friday that it would cease support for its Tango computer vision and augmented reality initiative on March 1, 2018. 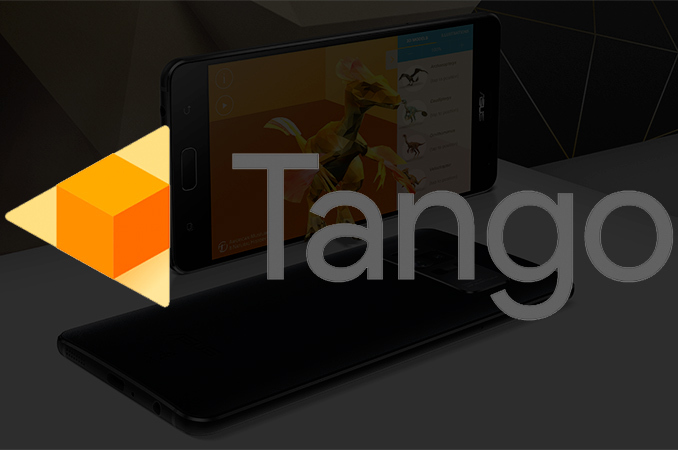 The company urges Tango developers to migrate to the more common ARCore framework that does not need specialized hardware and thus can be used with mainstream smartphones. Google kicked off its project Tango in early 2014 with the goal to give mobile devices a human-like computer vision, primarily for the purposes of augmented reality. Tango uses custom hardware (an RGB camera, a motion tracking camera, IR depth sensors, accelerometres, gyroscopes, etc.) to capture what is going on around and then rather powerful compute devices (such as the Movidius Myriad 1 vision processor and additional microcontrollers for sensor hub and timestamp functionality) to process this data and understand positioning of the device in a room. Given the hardware requirements of Tango and their costs, the initiative was slow to gather traction outside of Google. Early last year Intel built a prototype of a Tango-supporting smartphone featuring its RealSense camera and an Atom SoC, then Qualcomm demonstrated its Snapdragon-based Tango-supporting concept. Eventually, ASUS and Lenovo have released Google Tango-supporting smartphones for consumers, but this is as far as Tango ever got. By contrast, ARCore does not need specialized hardware to support a significant part of the Tango functionality (at least when it comes to consumer applications) and promises to work on normal, reasonably powerful Android-based smartphones. Therefore, for AR software developers and for Google it makes sense to focus on ARCore just because it promises to be available to hundreds of millions of users worldwide. Google says that it has taken everything it learned from its project Tango to build ARCore, so it definitely was not useless. Meanwhile, Tango’s purported human-scale understanding of space and motion could be used for Google’s autonomous vehicles platforms. The latter already use custom hardware and the costs of sensors and SoCs are generally not a problem for devices like self-driving cars. Moreover, Visual Positioning System of standalone Daydream AR/VR headsets reportedly has its roots in Tango. So, while the project Tango is dead, its elements are going to be used here and there. Uhh... The tl;dr is that they're killing off Tango because of the prohibitive costs associated with Tango-exclusive sensor equipment which would otherwise lock it away from most customers. They're integrating as much Tango software/developments into ARCore which doesn't require specialized sensors and would be capable of being used on most any modern smartphone without major issues. I don't think he's correct on VR headset sales. From what I've read their sales are not as good as projected a few years back, but they are still slowly growing. The recent increased competition created by the entry of WMR headsets will help to drive further growth. The WMR headsets also feature inside-out tracking which is less expensive and less cumbersome than having to buy external trackers. "But what they really need the most are killer apps"
We're in that post-hype phase of the current VR/AR bubble, where all the nay-sayers are starting to feel vindicated. Meanwhile, the tech is continuing to evolve and many are quietly playing the long game. The hype-cycle is unfortunate, but seems an unavoidable part of technology development. This view only makes sense if believe the only devices people will ever use are smartphones. In that case, it's hard to see how Tango apps hit critical mass enough for smartphone makers to add the extra $30 or whatever to their BoM for a depth sensor (many phones already have a second image sensor). But when view as enabling Hololens-style AR headsets (another example: Magic Leap), Tango really makes a lot of sense. The problem is what to do until then. So, ARCore seems a reasonable stop-gap measure. What's unfortunate is that, as I understand it (and I've not had a chance to really dig into it) ARCore lacks some significant functionality that Tango provided. In order to kill off Tango, ARCore really needs to offer the same functionality on hardware with the same capabilities that Tango used. IMO, what really forced Google hand was Facebook and Apple, both of whom offered competing functionality to ARCore. Google doesn't want to cede this ground to them, so that's why they're focusing their development effort on it and pushing their most sophisticated AR app developers onto it.